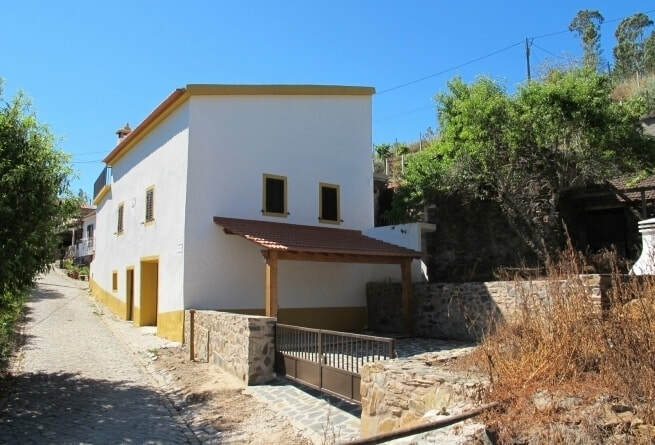 Casa da Ribeira is located in Mega Fondeira, not far from Pedrogao Grande, along the N2 road in Central Portugal. The property sits in a small hamlet and is adjoining the small river beach, which offers safe swimming as it is a constant depth. The house has three bedrooms, two with en-suites, a family bathroom, lounge/diner, kitchen, utility, second lounge and roof terrace. There is also a lockable garage and parking area, plus a cellar where the gas bottles are stored. External stairs from the utility lead down to a courtyard that has access to the rear of the garage and the land, which is at the side of the house. Various mature fruit trees and vines can be found on the multi-terraced land (2,600 sq mtrs) as well as a number of olive trees. Behind the parking area is an excellent schist ruin that could be developed to provide additional accommodation. Attached to this ruin is a small single storey wood store with an old bread oven. A further ruin is to be found high up on one of the terraces - perhaps a project for the future.